If, like me, you’ve donated to ProPublica, you’ve probably received an email from Jill Shepherd, ProPublica’s director of online fundraising and outreach. And as we approach the end of the year, you’ll without a doubt be getting many, many more emails from Shepherd. The end of the year is the most popular time for charitable giving as people get in the holiday spirit — and try to get those last-minute tax deductions. 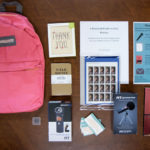 ProPublica is one of dozens of nonprofit newsrooms that are positioning themselves to make the most of the giving season. This week in Solution Set, we’re learning from ProPublica’s year-end playbook. Shepherd outlined for me how ProPublica plans for the end of the year, the messaging it uses, and the various channels it uses to reach readers. Even if you’re not a nonprofit newsroom, there’s a lot to learn here about how news orgs can convince readers to support their work, whether that’s through membership, subscriptions, or some other direct contribution. Solution Set is a weekly report from The Lenfest Institute for Journalism and the Solutions Journalism Network. Every Thursday, we take an in-depth look at one swell thing in journalism, share lessons and point you toward other useful resources. You can now also get Solution Set delivered each week via text message. Every Thursday, I send subscribers our weekly report, plus some added resources and a sneak peek at upcoming issues. You can also ask me questions or share your experiences directly via text. You can sign up by clicking here or by texting SOLUTION to (215) 544–3524. The Challenge: A large percentage of charitable giving occurs at the end of the year, and ProPublica wanted to make a strong appeal to potential donors. The Strategy: ProPublica began planning its year-end effort over the summer, and developed a sustained campaign to maximize donations and interest from readers. The Numbers: More then one-third of ProPublica’s 2017 low-dollar donations came during its year-end campaign. 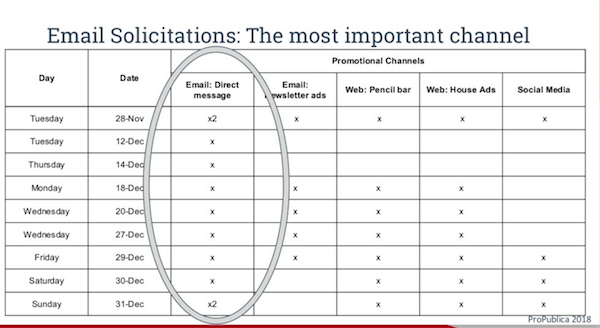 The Lessons: Email is the most important channel publishers have to reach supporters. Don’t be shy — most readers won’t mind if you send them multiple solicitations. The Future: ProPublica is taking a more aggressive fundraising approach this fall, and it’s launching a campaign this month. Want to know more? : Scroll down for more resources on fundraising best practices. Anything to add? : If you’re at ONA in Austin, come say hi! I’ll be chatting about some new research from The Lenfest Institute and The Shorenstein Center this afternoon. Scroll down for more details. There are two typical thought processes that people go through while deciding to spend money or donate to a charity: Logical thinking and emotional thinking. And these two types of thinking are at the core of Jill Shepherd’s work. Shepherd is ProPublica’s director of online fundraising and outreach, and she’s in charge of soliciting online donations from individuals. “Largely, I’m looking at people who donate under $1,000. If you’re the person who is going to give us $100, I’m your girl. I’m out there trying to get those people,” Shepherd told me, describing how she takes both logical and emotional approaches to encourage people to support ProPublica. Emphasize how potential donors regularly use and rely on your products. “At some point, they’re going to need to tell themselves: You know what, I do go to propublica.org a lot,” she said. Tell them how you provide value and make a connection about what they represent. For ProPublica it’s the focus on investigative journalism and independent media. If you’re a local publication, Shepherd recommended empathizing the local connection: “We are this town. We live it. We breathe it. And if you consider yourself of this town also, one of the things you can do is support this journalism,” she said. Be up front about how you need money. “It’s smart of us to lay out why the things we do cost money,” Shepherd said. Make it clear that you need the funding to come from your audience. “We don’t have one rich owner,” she said. And when it comes to the emotional thinking, Shepherd said publishers should center their pitches around things such as limited time offers, upcoming deadlines, and swag — lots of swag. (I donated to ProPublica last year so I could get this T-Shirt.) These types of arguments can help get people to actually take out their wallets, she said. Shepherd joined ProPublica in spring 2017 and has spent the past year-and-a-half building out the site’s strategies to use these approaches to increase individual giving. And the season when these strategies are most effective is rapidly approaching. 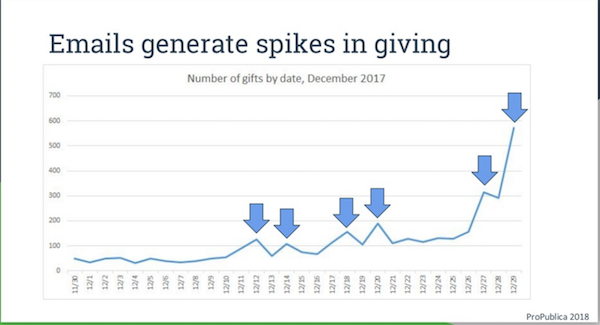 Whether it’s to beat the year-end deadline for tax deductions or because of the festive holiday spirit, most Americans tend to concentrate their charitable giving toward the end of the year. That means November and December can be busy times for nonprofit newsrooms seeking donations from individuals. 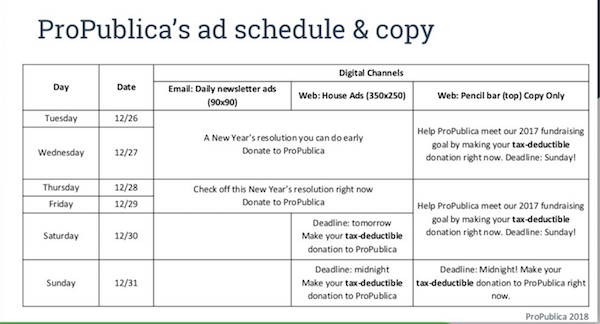 As the giving season approached last year, Shepherd developed a playbook for ProPublica to capitalize on the interest from donors. • July – September: ProPublica began planning for its year-end fundraising campaign over the summer. During this time it signed up for NewsMatch and Giving Tuesday. NewsMatch is a foundation-backed program that will match donations to participating nonprofit newsrooms across the United States. Giving Tuesday is a grassroots campaign to encourage people to donate to their favorite charities on the Tuesday after Thanksgiving. Last year, NewsMatch participants used the #GivingNewsDay hashtag to promote donations on Giving Tuesday. The deadline to sign up for NewsMatch has passed, but Shepherd said it’s possible also to find local foundations or sponsors to potentially match donations. And the benefit of a day like Giving Tuesday is that it gives people an excuse to give and it’s potentially one less hurdle for news organizations to overcome to secure a donation. • October: At this point, ProPublica had already begun to plan out its year-end campaign in more detail. 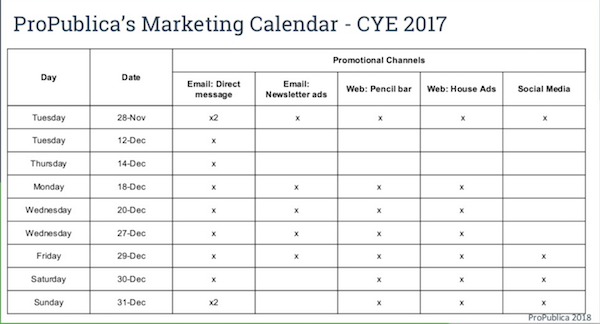 It created a marketing calendar, and it was ironing out details about the message it wanted to use, the channels it could use to reach potential donors, the audiences it wanted to target for donations, and the timing for when it wanted to push the messaging. For example, ProPublica planned out the dates different pitches would go out and what they would say. From Dec. 26 to Dec. 29, its messaging centered on how donating to ProPublica could be part of your New Year’s resolution. But by Dec. 30, it changed its tone to focus on the end-of-year deadline to make tax deductible donations. “Deadline: Midnight! Make your tax-deductible donation to ProPublica right now,” a banner atop its website read on New Year’s Eve. ProPublica used practically every space available to it to promote donations, and Shepherd recommended a wide array of places to ask donations: Ad slots on your website, editorial content areas, interstitials, email newsletters, social media, and more. Publications could target messaging to specific audiences: Your newsletter subscribers could get one message while people who have previously donated could get another encouraging them to give again or to give at a higher level. Publishers could also use social media tools such as Facebook’s lookalike audience tool to better target readers on social media — though Shepherd cautioned that news orgs should be clear with their readers about how they’re using their data. This is also the time when ProPublica. Was finalizing giveaways such as stickers and T-shirts to encourage donations. • November: By now, much of the planning was completed and ProPublica turned to execution. It made sure all the creative work for ads and promotions was complete. • #GivingNewsDay: ProPublica launched its year-end sprint with a full-court press on Giving Tuesday. 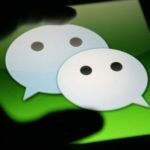 It sent out two email solicitations, ran ads in its newsletters, posted promotions on multiple places on its website, and also blanketed social media. When it comes to social media, the people who follow your organization on Twitter or like it on Facebook are probably in your publication’s core demographic and it can be a great opportunity to reinforce why your journalism is valuable, Shepherd said. However, publications should recognize that each platform is different and they should take different approaches for every platform. ProPublica publishes a combination of ads and native posts on Facebook, but it only uses native posts on Twitter. On #GivingNewsDay, it focused its Facebook messaging on the campaign. ProPublica ran an ad featuring NewsMatch until 11am, which is when it hit its match goal. After then, it re-focused the ads to cover the #GivingNewsDay campaign. ProPublica earned 40 donations from with a $19 return on investment from the ads, according to Shepherd’s INN slides. The ads also reached. 12,000 Facebook users. ProPublica averages $5 per 1,000 impressions. For Facebook advertising, it’s key to use concise messages and to direct users directly to your donation page. Twitter, meanwhile, is more informal. ProPublica used fun images and was more conversational there. It tweeted about #GivingNewsDay more than a dozen times. • Early-to-mid-December: After the initial splash of the campaign launch the pace of donations slowed to a trickle. “It is super scary,” Shepherd said. “Here at ProPublica, I’m the first one to do the individual giving stuff, and I can see our president saying ‘This is not going well! This is really slow!’, but in the last two day sof a campaign, up to half of the money comes in…it feels like it’s really terrifying to people who arent’ familiar with campaigns. It’s hard to dig deep for that confidence. Shepherd and ProPublica used this time to get ready for the rush at the end of December and also to remind readers that the end of the year is coming and that they should donate. • Christmas-New Year’s: This is it. The homestretch. At this point ProPublica wasn’t shy about promoting giving opportunities as the year came to a close. It sent multiple emails and also promoted it heavily on social media. This is when all the work ProPublica put in over the course of the campaign paid off. People respond to deadlines, and “December 31 is the best deadline,” Shepherd said. Twenty-three percent of the money ProPublica raised during its 2017 year-end campaign was donated on New Year’s Eve. Fifteen percent came on #GivingNewDay. More than one-third of ProPublica’s total low-dollar revenue for 2017 came from this campaign. ProPublica’s average gift is around $100, Shepherd said, but in December it was closer to $150. Fifty-five percent of donors had given previously. 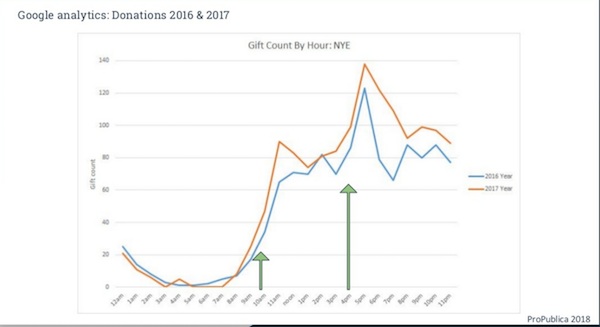 Seventy percent of the gifts — 2,600 donations — were initiated via an email solicitation, 20 percent came from ProPublica’s homepage, and 10 percent were from other sources. Over the course of nine days during the campaign, ProPublica sent 11 emails to five different audience segments. The average open rate was 21 percent, and the average recipient opened the emails three times. • Email is essential: Email is the most effective tool news organizations have to reach potential donors. By giving you their email address, a reader has expressed some interest in your publication and as a result is more likely to support you financially. An important first step you can take toward growing your online fundraising capacity is to grow your email list. Don’t be shy: Asking for money is hard. It can be uncomfortable. But in order to succeed you can’t be afraid of asking your readers to support your work — and then asking again, and again. You can’t be afraid that you will bother people. Especially at the end of the year, you’re competing with other charities and nonprofits that are also asking for donations. You need to make sure that your message gets heard. Over the course of its year-end-campaign last year, ProPublica sent dozens of emails, but only averaged a 0.41 percent opt-out rate. On peak days — #GivingNewsDay and New Year’s Eve — ProPublica even sent two emails. But on those days, it used its analytics to maximize its chances of success. At the time, ProPublica didn’t have time data on its donations, but Shepherd was able to use Google analytics to see when the most people were visiting the site’s donation page. She went back and looked at New Year’s Eve 2016, and found that there were peaks in traffic to the donation page in the late morning and in the late afternoon. She used that information to plan when to send out email solicitations on New Year’s Eve last year. • Campaign mentality: Donations don’t just happen overnight. It takes time to get your message out to potential donors and to convince them to pull out their wallets and support your journalism. You need an ongoing campaign to make your support to donors. One of the first things Shepherd did when she joined ProPublica was set up quarterly campaigns. By regularly reminding readers of both the logical and emotional reasons for why they need to support ProPublica, Shepherd is laying the foundation for increased support. Campaigns are getting longer as well. Shepherd initially planned to run a seven-day campaign this month, but she’s going to extend it to 10 or 11 days. For the upcoming holiday season though, ProPublica is participating in NewsMatch again, and it’s also planning to be more aggressive in its outreach to potential donors as well. Shepherd said she’s worried about potentially overwhelming readers — but she doesn’t think ProPublica has reached that point yet. • Here are Shepherd’s INN slides that I’ve referenced throughout this report. • Learn more about NewsMatch here. More than 150 news orgs are participating this year. • The Shorenstein Center has a post about why you should be sending more fundraising emails. • Check out this list of resources about consumer revenue from The Better News Hub. Are you at ONA? If so, let’s find a time to chat. I’ll be here through Saturday and would be curious to learn more about all the cool things you’re working on. My Lenfest Institute colleagues Burt Herman and Sarah Schmalbach are also here. They’re great, and you should talk to them as well. Also, if you’re interested in business models for local news, I recently co-wrote a study with the Harvard Shorenstein Center’s Elizabeth Hansen and Emily Roseman about business models for local news. You can read the study here, and we’ll be around this afternoon to chat about it. We’ll be on the 4th floor of the Marriott near the registration desk from about 2-4pm today. Come say hi! If you’re not in Austin, feel free to reach out over email or SMS with any questions, concerns, or story ideas.